Custom wristbands are a great way to express yourself. Our customizable wristbands are 100% latex-free silicone. 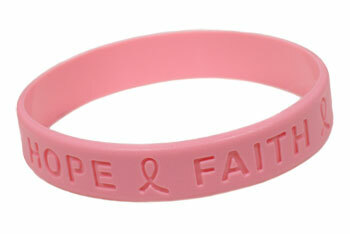 Order custom wrist bands to promote your cause, advertise your business or remember a loved one. Custom silicone bracelets at MakeYourWristbands.com are available in limitless colors, are hypo-allergic and are of the highest quality. With our wristbands you can choose multiple styles. You can opt for debossed wristbands or choose their extroverted twin, embossed wristbands. We offer same day production with no minimum, so you can order as few as one band or you can even order them in bulk. Our high-quality silicone wristbands will be shipped out at the earliest so that your order can reach you on time. The quality of our custom wristbands is second to none. Just ask one of our happy and satisfied customers or read the testimonials on our website. For further assistance or to place an order, you can call a Make Your Wristbands representative at (800) 715-4445. We are available seven days a week for the convenience of our customers. We offer tailor-made solutions depending on our customer's needs. Make Your Wristbands representatives will gladly assist you in designing the best custom wristbands to make your occasion more special. For a limited time, we are offering 100 free wristbands with a minimum order of 100 wristbands. Upload your own artwort and truly create a custom wristband!